Minister of Antiquities Khaled al-Anany will on Wednesday evening inaugurate a temporary archaeological exhibition at the Egyptian Museum that will include artifacts excavated by a Dominican archaeological mission which has been operating in Egypt for about ten years in the Taposiris Magna area in Alexandria, Youm7 reported. 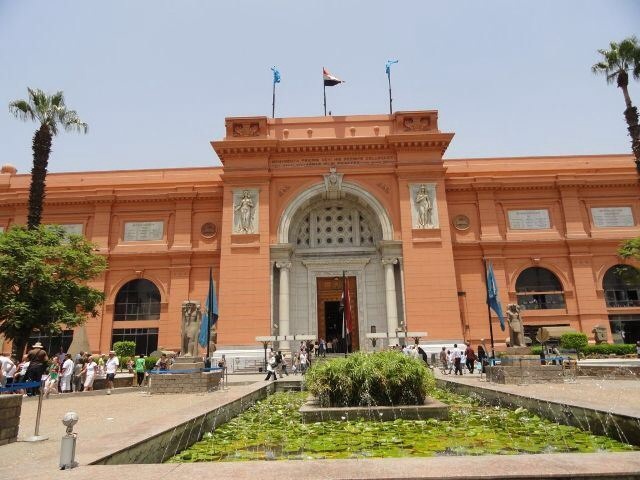 Head of the Museums Sector Elham Salah said that the exhibition is an unprecedented and unique experience as it presents a collection of artifacts for the first time after being found in the area of Taposiris Magna in Alexandria. Salah referred to the importance of the archaeological site dating back to the time of Queen Cleopatra VII. Salah added that the exhibition includes about 300 artifacts, which are a clear record of daily life, administrative and religious activities, and the royal and social role that emerged at the end of the Ptolemaic period. They have been arranged in the exhibition according to the places of discovery, she pointed out. Director General of the Egyptian Museum Sabah Abdel Razek explained that one of the most important pieces of the exhibition is a unique painting inscribed with hieroglyphic and demotic writing, reminiscent of the gifts given by Ptolemy the Fifth to the priests of the Isis Temple. Head of the Dominican mission Kathleen Martinez pointed out that some of the most important signs thatÂ Taposiris Magna was a vital location for Queen Cleopatra are that statues of the goddess Isis, coins and paintings with many inscriptions dating back to the era of Cleopatra were found in the site. The exhibition also includes some distinctive pieces, including a bronze piece in the form of a fly that was dedicated by the king of Ptolemy to a soldier due to his bravery and dedication in battle, and a number of bronze coins inscribed with Isis on the front, and Cleopatra's name on the back. Martinez said that the discovered pieces so far are a reminder that there is still much to be discovered about the mystery of Cleopatra VII rule as well as the mystery surrounding the burial of many Ptolemaic rulers of her predecessors. The expedition also found during excavations a large cemetery outside the building of the temple dating back to the Greek Ptolemaic period. Mummies covered with gold were found in the coffins at the cemetery with their heads looking towards the temple as if an important person was buried in the temple. Martinez believes that Cleopatra and Mark Antonio were buried inside the temple of Isis and Osiris in the area of Taposiris Magna, about 45 km west of Alexandria, due to the religious and political importance of the temple. During her reign, Cleopatra always linked herself to Isis and linked Mark Antonio to Osiris. After the death of Alexander the Great, who invaded Egypt in 332 BC and founded the city of Alexandria, the Macedonian state in the Ptolemaic era was established, Martinez said. Over the course of about 300 years of Ptolemaic rule of Egypt, Egypt flourished culturally and mixed ancient Egyptian and Greek art, religions and languages. The temples represented after that the main idol Serapis, the god who merged between Apis, Ptah and Osiris in a Hellenistic framework. Isis was always likened to Aphrodite during that era.